Recently, several Dutch drinking water companies have developed an interest to divide their networks into District Metered Areas (DMAs). Historically, DMAs have not been commonly applied in the Netherlands, so implementing a division into DMAs requires a large investment. Moreover, the Dutch networks traditionally have an extensively looped design. This makes it especially complex to design a division with as few DMA boundaries as possible to reduce implementation costs. 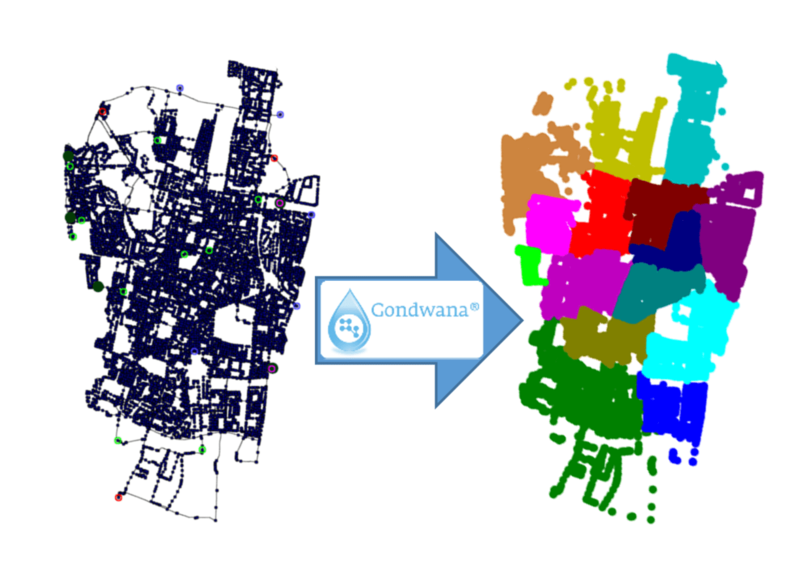 Therefore, KWR’s generic tool for network optimization, Gondwana, was equipped with the functionality to optimize DMA designs using genetic algorithms. As a first practical use case, we joined a team of experts from the Dutch water company Dunea to optimize their DMA design for the city of the Hague. Within Dunea’s budget, a division into 15 DMAs with 6 boundaries per DMA was found. Given the Hague’s extensively looped design, this result exceeded all expectations, demonstrating the value of automated optimization methods in network design. Moreover, a timeline for a phased implementation of the DMA’s was developed. This provides the water company with a plan for which boundaries to install in which year, in order to divide the network in subsequently smaller DMA’s as efficiently as possible.